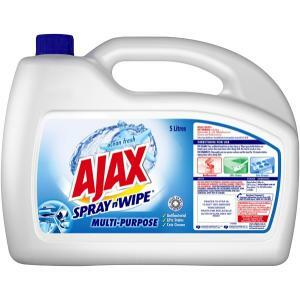 Ajax Spray n' Wipe Ocean Fresh Multi Cleaner suitable for most surfaces Kills 99.9% of germs, cuts grease and lifts stains. A convenient 5 L bottle to refill smaller handy spray bottles. It can be used to clean and disinfect frequently accessed areas. The solution is formulated to kill up to 99.9% of germs and bacteria. It has a pleasant ocean fresh scent.